Do you postpone what needs to be done “NOW” till later?..I am so guilty too! Proscrastination is defined as the “practice of doing more pleasurable things in place of less pleasurable ones, or carrying out less urgent tasks instead of more urgent ones, thus putting off impending tasks to a later time. The following and more may be the reason people procrastinate. Perfectionism : a tendency to negatively evaluate outcomes and one’s own performance, avoidance of evaluation of one’s abilities by others, heightened social self-consciousness . Procrastination can take hold on any aspect of life E.g. Putting off cleaning the gas cooker, repairing a leaky roof, seeing a doctor or dentist, submitting a job report , filing tax returns or broaching a stressful issue with a partner. Procrastination can lead to feelings of guilt, inadequacy, depression and self-doubt. When we put things off, they aggravate us. We may not even be consciously aware of it, but unfinished projects pressure us. Procrastination is like a credit card , a lot of fun until you get the bill…Confusion and disorderliness then sets in as a result of an overwhelming lot to deal with…. Seek help for self-defeating problems such as fear, anxiety, difficulty in concentrating, poor time management, indecisiveness, and perfectionism. Set meaningful and realistic goals, and write out what needs to be done monthly, weekly and daily in order of priority. Set a timeline for execution and discipline yourself to the priorities you set. Restructure activities of daily life. Modify your environment for that newly gained perspective. For example, eliminate or minimize noise or distraction; put effort into relevant matters. Tackle issues in small blocks of time, instead of trying to solve whole problems at once and then be intimidated. Reward yourself in a balanced way for accomplished tasks. 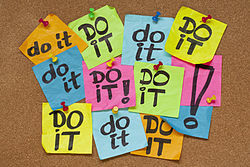 Procrastination can be persistent and tremendously disruptive to everyday life. It is important to form the habit of being a “NOW” person , one who does what needs to be done as soon as they can to avoid disorderliness. All truly successful people have this habit …..
God is not the author of confusion , but of order and peace (1 Corinthians 14:33). Has procrastination affected your personal growth in any way? How have you dealt with it? Would love to know in the comment section ..
Procrastination has affected me a whole lot. Really want deal with it.